My friends over time, convinced me that the only rewards in painting are those derived from doing it. I realized if that is the case, then I was painting the wrong things. I love the ocean, the sky, the clouds, the waves and the misty haze of the distant horizon against the depth of the sea. To get that from the paint is fascinating and I do genuinely enjoy it. The ocean in all her glory and power tugs at me. It fills my mind as I play music and I feel it is right in front of me when I paint it. I place myself at a moment standing on the shore of the ocean in my mind’s realm. Then, I paint what I see with all the emotions of that moment and this one. It is a very right now sort of thing. Although my art hangs in collections across the country and in people’s homes throughout the world, there are a variety of subjects conveyed in these artworks. 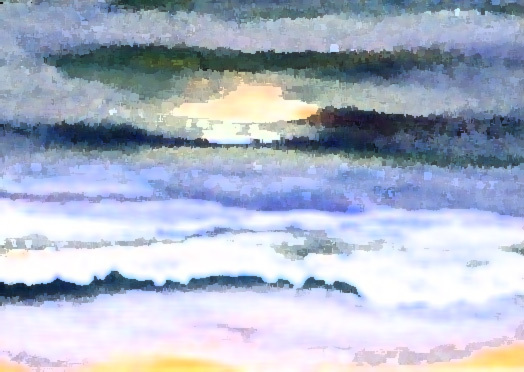 Very few of them show the love and deep admiration I have for the sea that shows up in my current works. I want to capture the essence of that moment standing at the ocean in all the complexities of color and motion found in the waves and sky. 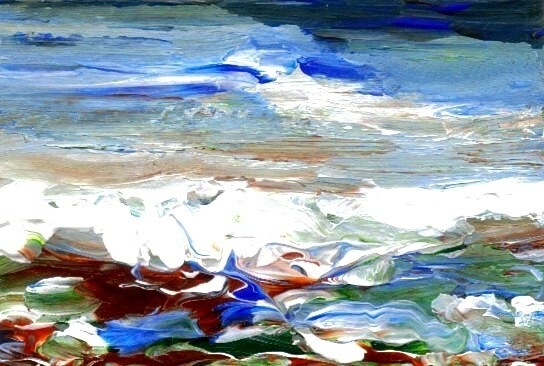 To communicate the awe, the mystery and the wonder of the ocean that awakened my spirit in that moment is the goal of each painting. 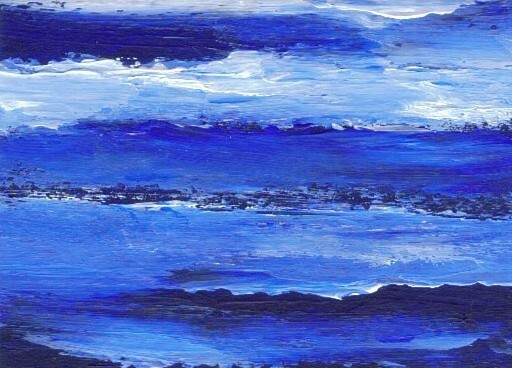 Anyone who is fascinated by the many moods of the ocean will love these. 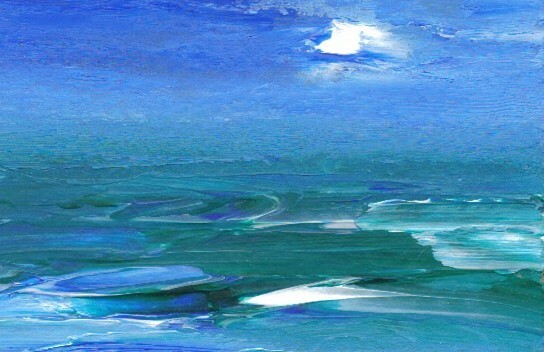 Just as the ocean is always different anywhere it is seen and anytime – each artwork conveys a unique moment of the ocean’s character. They are a perfect place for the mind to wander and be healed of worldly worries and stress. I love to let my imagination play in the paintings I create. I do when creating them and each time I see them. I love having art that I can hold in my hands. 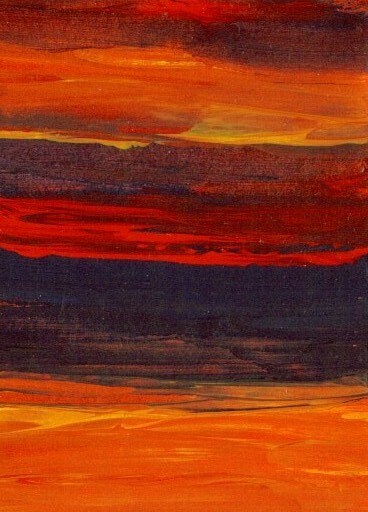 The paintings I’m doing right now are small, trading card sized originals – slightly larger than a credit card. They are real art that I can hold in my hands and let my mind loose to play in the spaces created there. The ocean holds mystery in its power and awe-inspiring captivation of the senses when I am there. 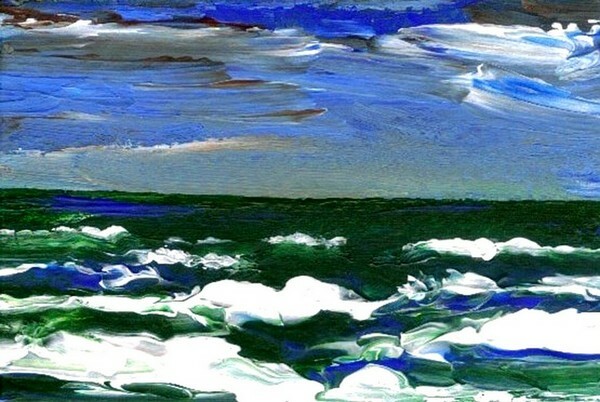 When I paint it from my mind, there is an intimacy with that moment and an admiration of the sea that I feel as I move the paint around to form what I see. This process has created the most visually rich and tangibly rewarding work I’ve ever accomplished. It truly is real art that I can hold in my hands and enjoy. “Happiness either is or isn’t – might as well be today as anytime.” – Cricket Diane C. Phillips, February 5, 2008. All rights to this and all images created by Cricket Diane C. Phillips remain with the artist. Thankyou. Each day, I create. Today, paintings were designed, aceo ocean cards (2.5″ x 3.5″ trading card sized art) were hand-painted, two recipes were created for sauces and one recipe was created for a chicken entree. Writings were made for my website content, including things about art, tips and tricks for artists and art collectors, plans and designs were made toward bigger projects and the tax forms were found and printed. I made a list of the types of things I am creating currently to go in some promotional brochures and started the design for my newsletter. It may seem like a lot but really it is easier to do the same types of things at the same time. The information being constructed for the website makes doing a newsletter at the same time sensible. There were recipes created because it seemed a good way to have something different for lunch. 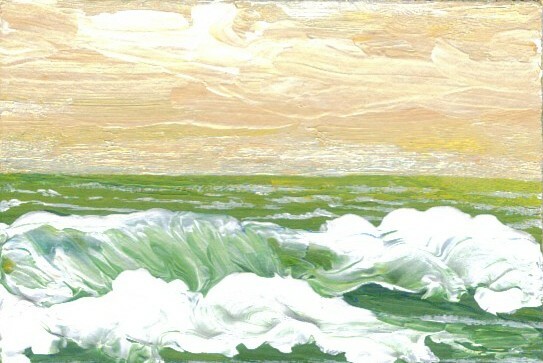 When my studio session ended this afternoon, there were eight new aceo / trading cards of the ocean in views I had not considered until today. I really like them. The two larger paintings only have a few more areas completed because of my work today. They seem to take so long at times. The things I’ve sold on Ebay over the last couple days are going to be shipped early in the week. I had to get a phone number to ship anything into France and another aceo ocean card was bought by a new collector of my work. That’s way cool.